Board shorts and flip-flops, because towing over the water is serious business. 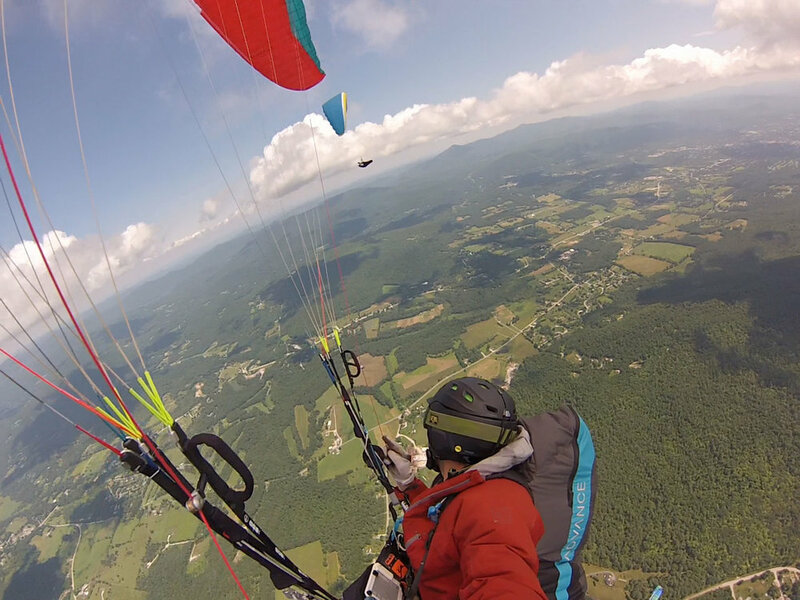 Paraglide New England offers maneuvers training so students can handle in-flight incidents with confidence. You may have noticed that time after time the same pilots seem to get high and fly far. What’s the secret to their success? Is it high performance equipment? Are they simply better? Nobody thinks repeated pilot success is just luck, right? I argue that glider pilot performance first depend on flying in the right place at the right time, second on mastery of kinetic skills, and lastly on equipment. Knowing where to fly is all about understanding the air currents and how to surf them to your advantage. Sounds obvious, right? But when you’re flying the world’s slowest aircraft, the implications cannot be over-exaggerated, so let’s dig into this topic. Our ultimate goal is to understand the air currents and how to sail them to maximizes altitude, flight time, distance, and safety margin; a lofty goal indeed. The author and Ryan Dunn headed North from West Rutland, VT. So how do we understand an invisible torrent that we can’t see? Fluid dynamics, the study of the flow of fluids in both the liquid and gaseous state, can inform our piloting decisions. It turns out that the air we fly in flows very similarly to water. This is useful because we can observe the movements of water as it cascades over and around obstacles in a way seldom seen in the air. The same understanding of fluid dynamics that allows kayakers to surf a “pillow wave” in the river enables glider pilots to soar the compression in front of a mountain. 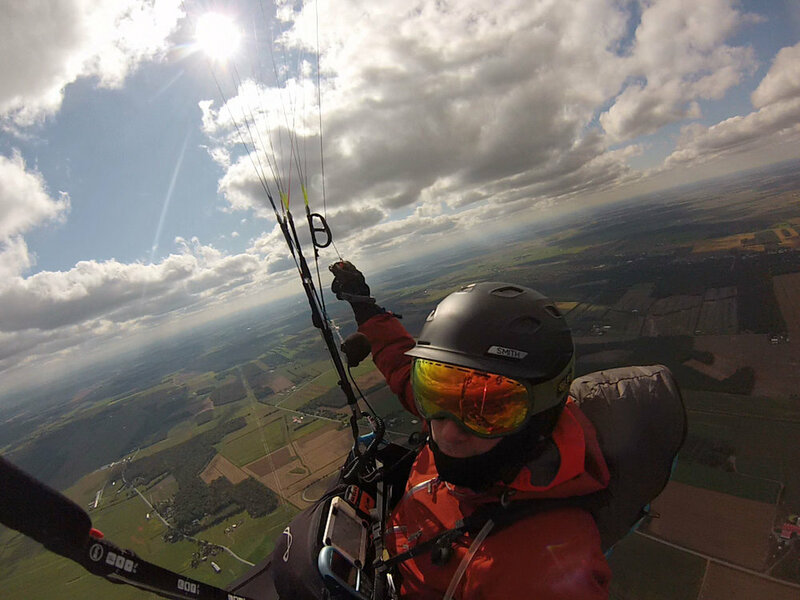 That’s why whitewater kayakers make outstanding paraglider pilots; just ask Will Gadd and Gavin McClurg. There are many comprehensive guides on surfing sky currents. Read up and explore these concepts. Build mental models of the fluid dynamics of the air you are flying in. While flying, you should consciously test your mental models of the air. Does the air you are experiencing support your model? This is fun work, but serious too as there are real consequences when we get it wrong; so for this article I am going to share some thoughts on the hazards in an effort to inform yearling explorations into the invisible currents. Jasper Gibson hamming for the cam on tandem with the author. Wind rotoring over a row of trees or buildings is easy to imagine and avoid, but mechanical turbulence lurks in many places you may not expect. The size and severity of mechanical turbulence depends on the terrain and the wind. “The wind” can be thought of as a vector, which describes speed and direction. It’s the combination that matters and small changes in ether aspect can have dramatic implications. There was a tragic accident recently where an enthusiastic P3 launch alone in a wind speed he had flown before and a wind direction he had flown before, but he had never experienced the combination. The results proved fatal as the strong wind crossing the mountain created powerful mechanical turbulence that propagated parallel to the ridge. Be hyper conscious of how the wind may interact with the terrain. Surf the most windward faces and give a wide berth to anything that may cause rotor. Mechanical turbulence will often have a rising component; so don’t be that fool who attempts to soar the rotor. We have our friends to thank for wake turbulence. You primarily need to worry about wake turbulence while ridge soaring because you’re typically quite close to the ground (the part that hurts) and the laminar air flows associated with ridge lift create the strongest wake turbulence. On the ridge, you will find wake downwind and above you friend’s flight path. Above because the air blasting up the ridge propagates the turbulence upwards. 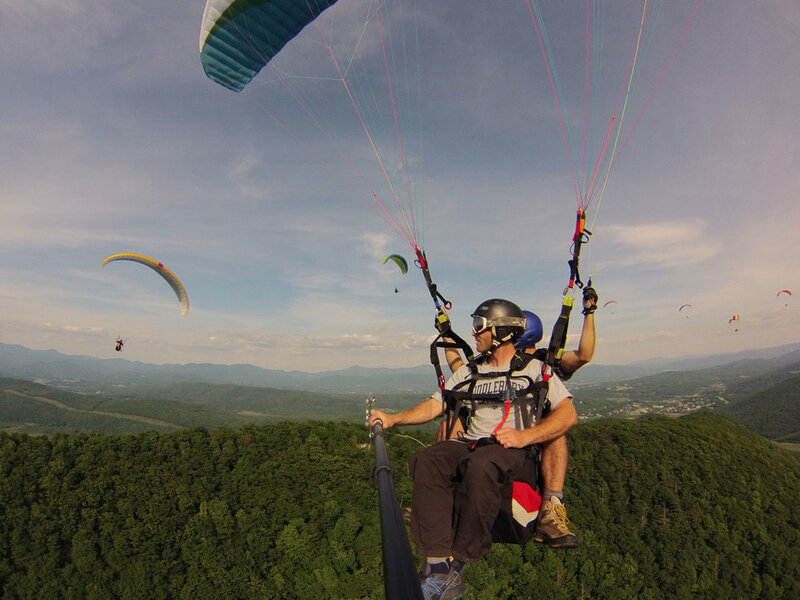 The power of wake increases with wing loading, so a tandem will rock your world. If you’re concerned about a wake, you keep extra ground clearance or alter your flight path. Brace yourself for impact by holding an inch or two extra brakes. Respond to wake turbulence with timely active piloting. The one situation in which you can wake yourself is if you exit a spiral quickly and climb into the air you just mixed up. Don’t do that. Exit spirals slowly to dissipate your energy. If you exit quickly, you can avoid your wake by switching directions with a wing-over type turn, but this has it’s own risks. My favorite! Every day is different, so don’t assume that you’re ready to rumble just because you’ve enjoyed a couple hundred hours in thermals. Stronger climb-rates, high pressure (with sharp edges), and wind contribute to the rowdiness. Thermic turbulence is most dramatic on the edges of thermals, so rather than bumble in and out of them, it’s best to get in a thermal and crank a turn. Don’t stop until you’re as high as you can get. Get over any lingering fear of heights; higher is safer as it’s the ground that hurts. If you’re concerned about the thermic turbulence, turn harder. While less efficient, the centrifugal force will load the glider and make your wing more collapse resistant. This works especially well if you can center your turn on the strong lift in a thermal core. If for whatever reason (perhaps downwind drift or traffic) you want to leave the party before it ends, it’s best to sneak out the side as the compression on the windward edge and the sink and turbulence typically found on the leeward edge can prove rowdy. Technically all turbulence is wind shearing against itself; so “wind gradient” is perhaps a more appropriate name. Strong wind shear is created by laminar flows with different vectors transitioning in a small area. It’s really common to find this between different vertical layers in the atmosphere. In Vermont we often experience a rowdy wind sheer when going out to land after a smooth glassoff flight. Winds shear is less present earlier in the day because the thermals mix up the layers and disturb the definition between the boundaries. When the thermals die, the atmosphere decouple into distinct layers again, which is why we find wind shear in the evening. Unfortunately, a friend of mine was recently trounced by a wind shear. He was flying at 6:30 in 13 MPH wind and the turbulence at the abrupt transition to calm air in the valley gave him a 50% collapse that cravatted. Let’s just say it ended badly with many broken bones. A little extra brakes while transitioning through the shear can help, but focus on active piloting and keeping ample ground clearance when you suspect a wind shear. All sorts of interesting things can happen when two air masses collide. Convergences can produce widespread lift that’s an EZPass to 501’ below cloudbase… or it can give you a 70% collapse at 200’. So don’t take convergence lightly and be respectful! If you’re down for the tussle, when you’re high convergence lift can be a real, real good time. But when you start to get low, it may be safer to fly out of the convergence zone for calmer air to land in. An excellent example of the fluid dynamics, river currents help us understand air currents. Rotor mixed with thermals grows the forbidden fruit of the leeside thermal. The rotor can draw thermals from a source up the leeside of the mountain in a manner that can at times resemble windward side thermals… Except the thermal is fighting up through rotor, so it’s rowdy by nature. This black magic is inappropriate for many pilots. Chris Rodgers and the author enjoying glassoff at West Rutland, Vermont. The atmosphere gets colder the farther away from the surface you get, except for intermittent warm layers. When you plot the temperature of the atmosphere at each altitude, the slope of this line (referred to as the “lapse rate”) inverts at the warm layers, thus the name “inversion.” There are two causes for turbulence at inversions. First, the different layers often have different wind vectors, which create shear turbulence. The second, more “exciting” cause for turbulence is that inversions act as a bearer to thermals. Here’s how it works: With a favorable lapse rate, your hot air elevator will keep going up as long as it’s warmer (less dense) than the air around it. When the thermal hits a warm inversion layer, it abruptly breaks apart. Many times pilots happily soar in thermals until they climb high enough to bang up against the inversion and think: “The air is getting turbulent! Perhaps I should go land?” But it’s important to recognize the inversion because often the rest of the sky is perfectly enjoyable, so you need not rush out to land. Banging against an inversion isn’t much fun, but it’s one of those situations where bump tolerance and perseverance can pay off because if you are able to punch through it you can get rewarded with smooth, abundant lift in a new layer of the atmosphere. It’s not uncommon for the atmosphere to have inversions at regular intervals (perhaps every 2,000’), so you can enjoy this fight several times in a single thermal. We often don’t punch through inversions on our first attempt, so be dogged in your determination. Pay attention to what altitude the turbulence starts at. As the day gets progresses the inversion will lift or breakup all together. The author doing flatland XC from Mont Yamaska, Quebec. Turbulence is attention-grabbing feedback that helps us evaluate the accuracy of our mental models of the air. Sure it can be scary, but try to understand why you’re getting jostled about. Does your mental model call for such turbulence? Sometimes it’s best to “put on your spanking pants” and get as high as possible. But digging in for a fight when the situation warrants a swift retreat invites catastrophe. Nailing the correct response depends first on understanding the situation. How confident are you that you have correctly understood the fluid dynamics? So tough is good, but only if you’re also smart. While the turbulence archetypes I’ve discussed are pretty easy to get our heads around, they’re just simplified models. Reality is infinitely complex; so don’t underestimate our ability to misunderstand the air. Remain skeptical. Spook early and often. Never forget- there’s no fame, fortune or glory in our sport. It’s all about fun. So if you ever don’t understand or enjoy what’s going on, make the conservative decision so you can play again another day.